At this event, we’re also especially pleased to be re-launching a Creative Commons Canada affiliate. Athabasca University, BCcampus and CIPPIC have joined forces to form a new CC affiliate team in Canada. With the Open Data movement exploding, this is an opportune time to find out more about it and discuss it. Most major cities in Canada now have open data portals where municipal governments openly and freely release public sector data, such as maps, statistics and other government documents. The federal government is making open data the central focus of its Open Government Initiative in order to increase transparency and citizen participation. 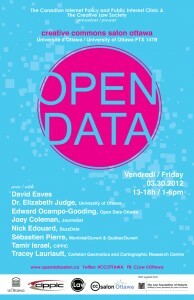 This event is also not just for data users! We will be facilitating a roundtable discussion for data providers to discuss compatibility issues between the licenses of different data portals. Creative Commons, which already provides the default license for open data portals in Australia and New Zealand, is renewing its focus on data for the next version of their license suite (version 4.0). This roundtable will provide an opportunity to talk about how governments can make their own data portals compatible with this international standard, and about the possibilities for adopting Creative Commons licenses.